Graduated from the Koźminski University in Warsaw with a degree in Marketing, Management and Finance & Banking. His wide-range knowledge in the field of strategic management he acquired at the School of Economics and Management at Lund University in Sweden. Moreover, he accomplished International Consulting training in Audencia Nantes Management School. He gained his experience i.a. at Frosta A.G. in Bremerhaven, where he reported directly to the Marketing Director. He performed functions of general director of the Association of Frozen Foods, that brings together dozens of biggest producers of frozen food on Polish market, including representatives of global brands such as: Unilever, Farm Frites, Bonduelle. 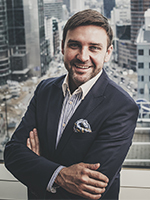 While working in the Warsaw International Fair he has contributed to organisation of three editions of the largest motor show in Poland – Warsaw International Motor Show. Subsequently, he worked in Expomedia Events Warsaw, where he held the position of director for business development and sponsorship relations. The next stage of his career was transition to conference sector. She is a graduate of the Faculty of Journalism and Political Science at the University of Warsaw, specializing in international relations. Since the beginning of her career, she has been involved in the conference and training sector; with MM Conferences since 2008, currently in the position of Vice-President of the Management Board. She has been a co-author of several dozen conference, workshop and gala projects, i.e. the Banking Forum, the Telecommunication and Media World Symposium, the Smart City Grand Gala Smart City Awards, the FinTech Digital Congress CEE and BIG DATA: Think Big CEE Congress. In the course of her career, she has successfully co-created several hundred projects aimed at the telecommunications, media, banking, insurance, power, production, HR and IT sectors.